Violations of fiduciary obligations, acting without the client’s consent. Some other examples of common attorney mistakes are: breach of fiduciary duty owed to client (duty of loyalty, duty of confidentiality, duty of honesty); conflicts of interest; ethical violations; inadequate discovery of facts and/or negligent investigation of facts; failure to obtain consent from client; failure to follow client instruction; negligent settlement and/or contractual drafting or negotiating; and mismanagement or mishandling of client funds. The above examples are not exhaustive. Many of the above examples of common attorney mistakes in the legal malpractice context can and will often overlap and are not necessarily mutually exclusive of one another. Remember, the above examples of common attorney mistakes and problems do not always constitute legal malpractice and will not necessarily be grounds for the filing of a legal malpractice complaint. The plaintiff must always be able to plead and prove the following elements of a legal malpractice claim: 1) the existence of an attorney-client relationship; 2) a breach of duty arising from the attorney-client relationship, and 3) causation; and 4) damages that proximately resulted from the alleged negligence of the attorney. Generally, legal malpractice occurs when an attorney, acting in their professional capacity as a lawyer is negligent. In this context, negligence is the failure of an attorney to exercise “reasonable care”—which means use a degree of skill that an ordinary member of the legal profession would use. 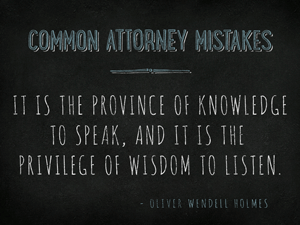 This often involves an attorney mistake. Contact our Chicago law firm to discuss your legal malpractice matter. To plead, and ultimately prove a case for legal malpractice, four elements are necessary. First, the plaintiff must plead and prove an attorney-client relationship. This element is most easily shown with an engagement letter or a similar contract between attorney and client. The second element of a legal malpractice clam is that the attorney breached his or her duty to the client. Examples of such breaches are set forth below, including blown deadlines, failure to know or apply correct law, misuse of funds, ethical violations and/or conflicts. The third element is causation—in other words, that the attorney’s negligence caused plaintiff harm or damage. This is typically referred to as the “but for” in a legal malpractice case. “But for” the attorney’s negligence, the client would not have been damaged. Finally, the fourth element of a legal malpractice case: actual damages. Damages are not presumed in a legal malpractice lawsuit, and must be proven by evidence and testimony. Most often expert testimony is required in legal malpractice cases for both liability and damages. We handle legal malpractice cases in state and federal courts throughout Illinois, including Cook, DuPage, Kane and Will Counties. If you think that you may be a victim of legal malpractice and would like to discuss your options, please contact our Chicago legal malpractice attorneys – 312-789-5676.